Huge Savings Item! Save 17% on the Super Wings - - Dozer | Toy Vehicle Set |, Includes Transform-a-Bot Donnie Figure | 2'' Scale by Super Wings - at Baby Stroller Car Seat Combo. MPN: US720312. Hurry! Limited time offer. Offer valid only while supplies last. ''I’m Dizzy and I’m rescue ready!'' On the hit preschool Super Wings show Dizzy, a pink rescue helicopter, is always ready to save the day. "I’m Dizzy and I’m rescue ready!" On the hit preschool Super Wings show Dizzy, a pink rescue helicopter, is always ready to save the day. Even though she’s the smallest member of the team, she’s incredibly strong, and the go-to helicopter when Jett is in trouble. She always knows exactly what to do when a problem arises. This set includes two transforming vehicles: Dizzy’s Rescue Tow vehicle as seen in the hit preschool Super Wings show and 2” scale transforming Dizzy figure. Dizzy’s Rescue Tow – Easily transforms from 7” tall Super Robot Suit to Rescue Tow vehicle with extending tow hook and real working wheels. 2” scale transforming Dizzy figure – Transforms from vehicle to bot in 3 easy steps, has real working wheels and easily fits in the cab of the Rescue Tow vehicle. Experience all of Jett's adventures together! Recreate favorite missions from the popular preschool TV show — including when Dizzy used her rescue balloons to help save the pirate ship, Woodbeard, from the cave in the British Virgin Islands. - Or when Dizzy helped save the penguins from a super strong waterspout as they headed to Antarctica! — Or create their new rescue adventures with their imagination! The Super Wings team is ready to take on any job – big or small – whether it involves navigating the rocky boulders of a volcano, delivering a tracker or helping to chase and capture a loose pack of pups, the Super Wings are always on patrol. With the help of Sky from the World Airport Tower, the team is always on the lookout for kids in need of help. As vehicles or robots, the team is always ready to transform and use teamwork on any mission to rescue, help and teach kids that there is a solution for everything. Time for a super upgrade! This set includes two transforming vehicles: Donnie's Dozer as seen in the hit preschool Super Wings show and 2" scale transforming Donnie figure. Donnie's Dozer - Easily transforms from 7" tall Super Robot Suit to Dozer vehicle with two scoopers and real working wheels. 2" scale transforming Donnie figure - Transforms from vehicle to bot in 3 easy steps, has real working wheels and easily fits in the cab of the Dozer vehicle. "Donnie is a genius when it comes to inventing things to solve problems. Known as the engineer of the Super Wings team, Donnie is loyal, good natured and with his tool kit, he can fix almost anything! 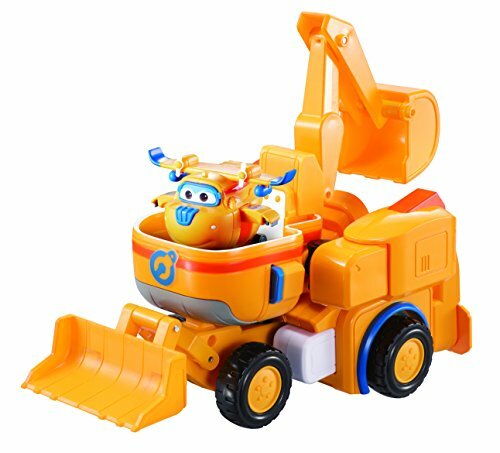 Donnie's Dozer and 2" transforming Donnie figure are for preschool Super Wings fans ages 3+. "Join Jett and his loveable transforming friends, the Super Wings, as they travel the globe to deliver packages, solve problems and help boys and girls around the world in the hit preschool show. Every delivery is a unique adventure filled with new cultures, languages and new friends! Includes one Donnie Dozer toy and one 2" transforming scale Donnie toy.